Asian American LEAD Updates! : AALEAD EAS facilitates a community spirit among our students. AALEAD EAS facilitates a community spirit among our students. One thing we notice among our students and parents is that they consider AALEAD as part of their community. 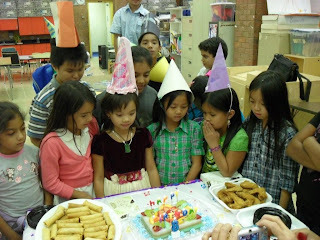 This is a picture of one of our birthday celebrants who has been in AALEAD for many years now, and who chose to celebrate her birthday with fellow AALEAD friends. 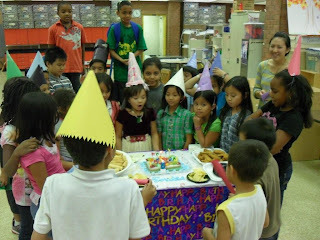 The students made birthday hats and a birthday card which everyone signed. Her parent made spring rolls and snacks and gave it to our students. 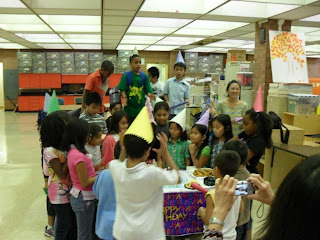 The birthday celebration was a blast and everyone enjoyed their time together.